One of my favorite things to make is a homemade sugar scrub. They leave your skin feeling soft and smelling amazing, and since the ingredients are so inexpensive, it is easy to whip up a batch anytime. In fact, you probably have most of the ingredients already in your pantry! This list is perfect for pampering yourself, or giving as gifts to your friends and family! I usually make my homemade sugar scrub recipes in small batches since I don’t use them every day. However, they are gentle enough for your skin to use daily if you wish. While some use basic vegetable oil, I much prefer coconut oil in my homemade sugar scrub recipes. It always leaves my skin feeling soft and I love that added coconut scent! 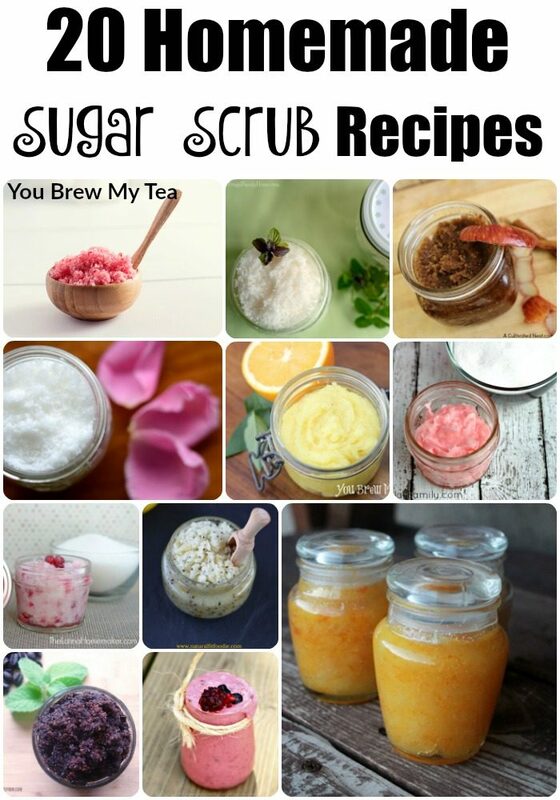 When making these homemade sugar scrub recipes to give as a gift, consider using a glass container to store them. Since many contain essential oils, you want to consider if they will cause reactions on plastic. When in doubt, a classic mason jar is ideal for gifting in. Half pint mason jars are just the right size to give as a gift! Many like to use fresh flowers or herbs in their sugar scrubs. You may even see some of the citrus homemade sugar scrub recipes including juice or zest. When you make a recipe using fresh ingredients like that, you do need to consider they have a shelf life and could spoil. Oils and sugar usually stand up for a considerable amount of time with essential oils, but that fresh zest or herb can easily get moldy if you aren’t careful. I always recommend telling people you gift these items to, that the should use them within one month. Just for safety! Check out our other great gift ideas! I love sugar scrubs. Though right now I have a coffee one, and I have to say its quite great, nothing like waiting up in the shower. 🙂 Have a great day! Sugar scrubs are so luxurious – and a fantastic make-it-yourself gift! Thanks for sharing with Merry Monday!